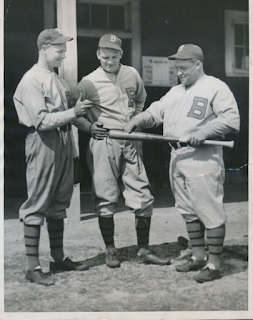 Waite Hoyt, former star of the New York Yankees and who rounded out last season as a member of the Philadelphia Athletics, with Hack Wilson, heavy slugger of the National League who served last season with the Chicago Cubs, demonstrating to Max Carey, new pilot (manager) of the "Robins," how they expect to contribute to a large extent with their batting and pitching in bringing the National League Pennant to Brooklyn this season. The boys are rather modest and had nothing to say as to how they expect to fare in the World Series. But the pennant and the World's Series are both far off for the boys are just about shaking off the winter kinks at the Robins Spring Training camp at Clearwater, FLA. This Day in Dodgers History: In 1934 the Dodgers traded Johnny Frederick, Art Herring and cash to the Sacramento Senators of the PCL for outfielder Frenchy Bordagaray. Frenchy would play two seasons on Brooklyn, slashing .297/.332/.389/.721, before being traded to the Cardinals. He would then come back to the Dodgers in 1942 and play an additional four season. Also on this day Commissioner Judge Landis denied the Dodgers' claim to eventual back-to-back no-hit hurler Johnny Vander Meer. The club had signed Johnny in 1933 as an 18-year old, but quickly gave up on him. By the next year, though, he had turned things around. So, the Dodgers filed a grievance claiming he was their property, but Judge Landis disagreed; stating that they only showed renewed interest once he starting throwing better. Happy Birthday, Frank Hansford, Andy Rush & Bonnie Hollingsworth! Per Jim Allen at Kyodo News; "Former All-Star Saito eagerly watching Ohtani's challenge." Instead of going to San Diego, which has a large Japanese presence in its front office, Ohtani chose the Los Angeles Angels. "It was a disappointment. I didn't imagine (him picking the Angels)," Saito told Kyodo News at the baseball winter meetings in Florida. "But it was his choice. We have to focus on our next opportunity." Ohtani is news not only because he is the first player to both bat and pitch in Japan at an elite level but because he aims to do both in the majors -- something no one has done since Babe Ruth in 1918. "He's actually aspiring to do both," Saito said. "They're going to let him try it, and then it's up to him. He did it in Japan, but that was Japan. In America it's going to be harder." 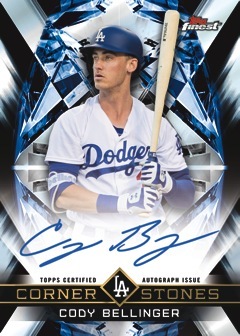 Blowout Buzz shares a bunch of preview pics from the 2018 Topps Finest set slated to come out on June 6th next year. Go here to check those pics out. To the right is an Cody Bellinger card. MLB's Baseball Savant website recently put up an interactive 2018 MLB season schedule map that shows that the Dodgers will be the 9th most traveled team this coming season. They are scheduled to fly 35,967 miles in 2018. The Mariners are first with 40,783 scheduled next season. As you might expect, teams located in the central part of the country will fly the least amount of miles.